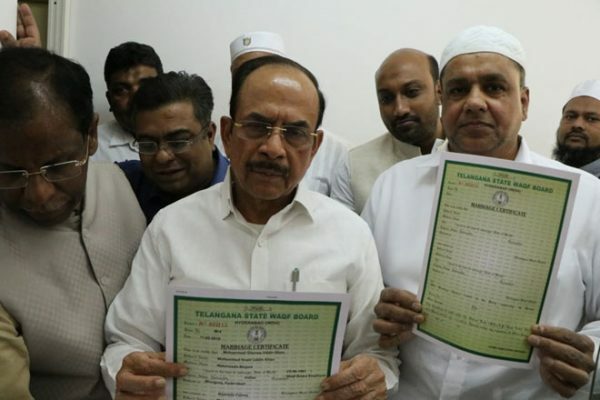 Hyderabad: Home Minister, Mohd Mahmood Ali on Monday inaugurated e-Qazath, the initiative that enables authorities at Waqf Board issue online marriage certificates to married couples. The unique initiative is expected to cut down the time taken to issue marriage certificates, which will be of great help for public, Waqf Board authorities said. Later, Home Minister Mohd Mahamood Ali, Waqf Board Chairman, Mohd Saleem along with Prince Muffakham Jah, the grandson of seventh Nizam, laid foundation stone for construction of a commercial complex ‘Princess Dura Shawar Technical Education Waqf Complex’ at Bogulkunta. The complex is being constructed on Waqf property and its income will be used for providing technical education to needy students. The Waqf Board Chairman said that Mufakam Jah would make arrangements to provide technical education to needy students.